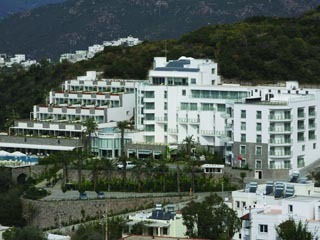 Casa Dell'Arte Village is a unique seafront, stylish village complex hotel at Torba Bay of Bodrum Peninsula. The Hotel has 77 guest suites equipped with the contemporary gadgets with an aesthetical touch. The latin name Casa Dell’Arte translated as “House of Art” into English, has 12 suite rooms individually decorated in the most exquisite taste evident in every detail of their architecture, natural environment, adornment and presentation. These suite rooms offering the ultimate level in comfort with up to date technology, are also galleries of art in themselves, featuring original paintings by renowned Turkish painters such as Hamit Görele, Fikret Mualla, Nuri İyem and Mehmet Güleryüz. This way the guests have the chance to enjoy their very own artistic atmosphere. The hotel itself resembles an art museum with many precious works of art adorning every corner. The Babylonians imagined the sky as a huge circle divided into twelve separate “Houses”, each representing different energy patterns on earth. And thus, the twelve signs of the zodiac which rule these divers energies was born. Similarly, each room at the Casa Dell’Arte comes decorated with works of art, each more prized than the other, and is like an astrological “House” with a different kind of energy. For this reason, each suite of the hotel bears the name of a different sign of the zodiac. 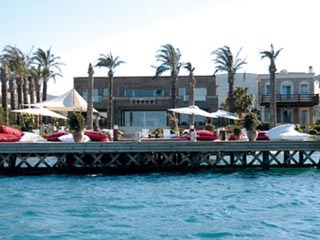 Luxury design hotel Casa Dell’Arte, situated at Torba Bay, one of Bodrum’s most enchanting spots, offers a novel resort concept which merges the merits of sea, sun, a rich range of flavours and art. All rooms come equipped with the customary services of air conditioning, safe, mini-bar, telephone and wireless internet connection but also feature the following facilities catering to the tastes of refined guests. Guests will have access to a private pier and a private beach for undisturbed sunbathing, a swimming pool, a garden jacuzzi with a view of the sea, a private boat and schooner to sail to the nearby coves or throw private parties. A private antique automobile collection is available for the guests’ use. The Casa Dell’Arte Restaurant offers buffet breakfasts as well as menus prepared by master chefs. A fitness hall, sauna, steam bath and massage facilities offer the guests choices to enjoy an ambience of well-being and relaxation. The Special Gourmet Cuisine, at the service of all guests who may wish to use it, is also available for cooking workshops throughout the year. A library is available as well as daily newspaper delivery service. 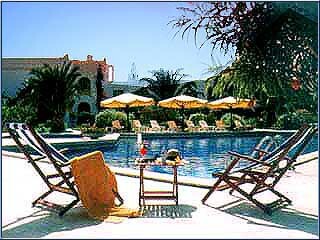 Transportation to and from Bodrum Airport is provided. 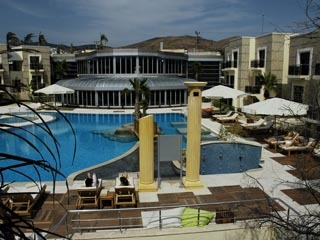 Open Buffet Breakfast and A la Carte Restaurant serving Mediterranean-Aegean Cuisine. The A La Carte Restaurant is the main dining hall of the hotel where you may enjoy not only superior service and tastes from its experienced chefs, but it also offers a house-party atmosphere where guests dine together at a long table , choosing their wines from specially built cellar. A special Bar and Snack Menu caters to guests who wish to eat at the seaside or poolside. For those guests who enjoy cooking their own culinary delights, you have the option of preparing your own meals in the gourmet kitchen.